The Gamma Eta Omega Chapter and our philanthropic entity, The Ivy Foundation, Inc. was proud to partner with the Greater Baton Rouge Food Bank. We value their mission to feed the hungry in Baton Rouge and the surrounding parishes by providing food and educational outreach through faith-based and other community partners. The CANN 5K Run/Walk featured a smooth, festive path in downtown Baton Rouge along the Mississippi River and Downtown Baton Rouge. Friends, family and curious spectators lined up along the course fun filled with exciting sights and sounds to cheer participants. The event included a warm-up session by local fitness expert and culminating awards recognition. We partnered with the Greater Baton Rouge Food Bank and Alpha Kappa Alpha Sorority, Inc. Gamma Eta Omega Chapter, Ivy Foundation college scholarships for students in Greater Baton Rouge and surrounding parishes. Our sponsors invaluable support and contributions made it possible for us to support the Greater Baton Rouge Food Bank and further provide scholarships which will benefit local high school students in the Greater Baton Rouge Community. We had 26 awesome sponsors. 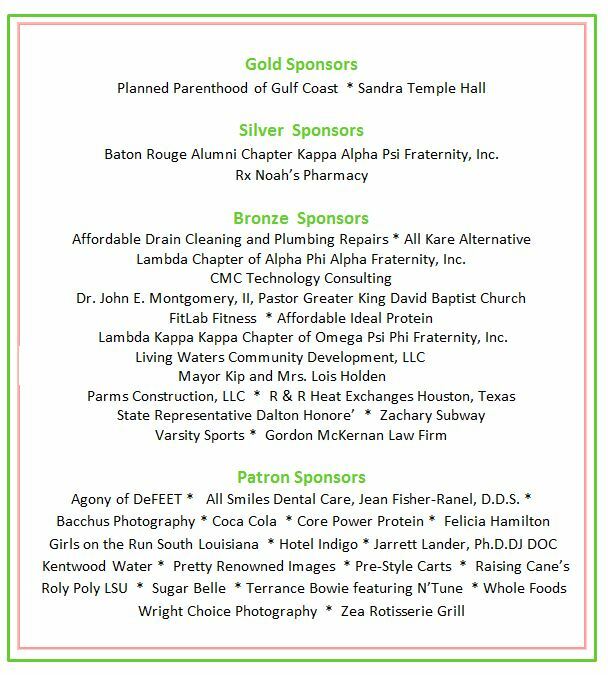 The Gamma Eta Omega Chapter of Alpha Kappa Alpha Sorority, Inc. in partnership with the Ivy Foundation, Inc. and the Greater Baton Rouge Food Bank is pleased to announce our inaugural Changing and Advancing Nutrition Now (CANN) 5K Run/Walk. The goal of the CANN Run/Walk 5K is to promote awareness of childhood hunger and to raise money for college scholarships for high school students in the Greater Baton Rouge area. The CANN 5K Run/Walk is will take May 30, 2015, 9:00 a.m., 222 North Boulevard Town Square in downtown Baton Rouge. Cajun Timers will provide official race results.